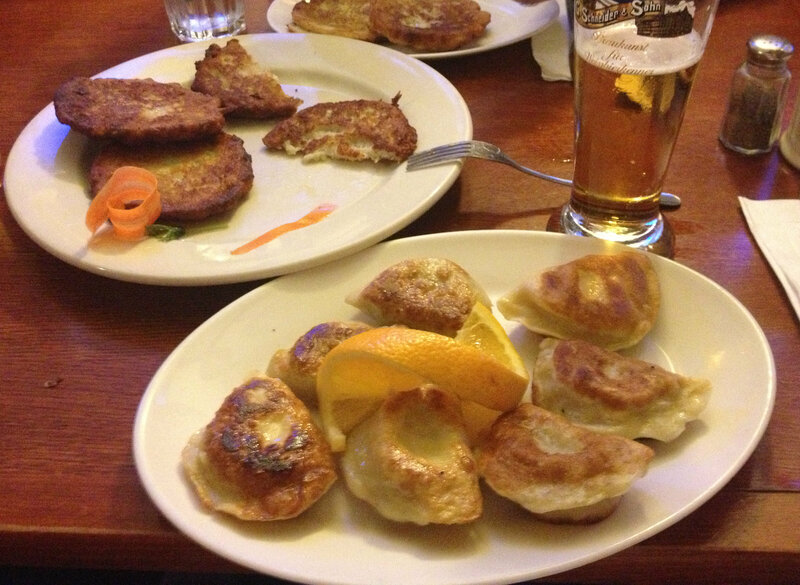 Every now and then a buddy of mine, who goes by the name El Diablo, sends me musings on dumplings, mainly on Pierogies. So to kick off the second year of Dumpling Hunter here are El Diablo’s thoughts on Neptune Polish Restaurant. I’ve been going to the corner diner in my neighborhood for over 15 years. Each time, I insist on sitting at the counter. Even though I’ve been doing this for 15 or so years, the guys who work in the diner always recommend that I sit in a booth. True, there are many lunatics who have been known to adorn the counter area (some dominating certain eras, others…..relegated to the Neighborhood Lunatic Cooperstown). I have picked up on the fact that the reason I’m encouraged to sit at a booth is not because of the vocal outbursts of the lunatic regulars, but because it is assumed that a booth is more desirable for a customer. Each time a booth is recommended to me, I respectfully decline and say that I would like to sit at the counter (and I do sit there each time). After several of these “No, the counter, please” conversations, I heard one of the employees say to one of the other employees in Spanish while gesturing to me “He’s sick in the head.” Rather than reflexively respond with the only appropriate response (i.e. the between-song Jello Biafra quote from an old Dead Kennedy’s bootleg: “Autograph my dental charts.”), I instead just kept sitting at the counter, tipping enough to offset the asymmetrical doubts the diner employees have about me. After all, Webb Wilder said: “Do right. Do right all the time.” What the diner employees didn’t understand, and still don’t, is that, whether prepared on-the-spot or long-preserved, diner food tastes better while seated at the counter…at least it does to me. The reason for this is probably something akin to scientific research involving how things like scent, for example, affect taste (the old “can you taste the apple or onion” thing). Why not the “counter vibe”? Similarly, there is a great benefit upon taste when immersing oneself in the struggles (now or in the past) of the Eastern Bloc. The condiment called “post-Communism”, if worked vigorously into the substance of an appropriately selected victual can not be measured empirically, but it can be tasted. A recent trip to a Polish restaurant I’ve been frequenting for more than 15 years (also) proves this point in so many ways. The restaurant? “Neptune” on 1st Avenue in NYC. Now please bear in mind that I’ve eaten many, many dishes at Neptune, and they’ve always delivered. The reason is because this is food for the masses – the oppressed masses who have been liberated and have emerged victoriously free. However, the taste of struggle-to-freedom is exquisitely contained within each bite. And, if the Romans carried their Eagle Standard into battle, I can only hope that the great Polish people (yes, Chopin was Polish, of course) carried a bronzed pierogi atop a pike into their struggle. Whether this previous statement can be viewed as metaphor or not, is not important. What is important is that a people emerged triumphant and intact enough to bring their culture to the world, and had the desire and love enough for their culture (and the world) to share it with us. At Neptune, I ordered a ½ order mixture of boiled meat and cheese pierogies (with sour cream) and a ½ order of potato pancakes. The pierogis were plump to the touch and visually glistened. I don’t think there was anything other than perhaps a bit of water and maybe some residual salt to the glistening surface which was fine considering that I knew what to expect from literally years of (hundreds of?) pierogis at Neptune: soul-enrichment, soul-acceptance, and the literal taste of the triumph of the average man over oppression. I am not kidding. The texture of the meat pierogis for example, had a sophisticated coarseness of texture that was exactly what you want to taste. What do you want – your pierogi to taste like L.A sushi? This is a pouch of meat, boiled, made to sustain hope and the fire within the individual soul literally struggling on the battlefield of life itself. To have this sensation in one’s mouth is to remember what each of our struggles is about internally, and how much we have sacrificed to just “to be”. This is an important sensation to remember, and these types of memories, like olfactory memories, remain deeply encoded within us…for good reason. Mixing the sour cream with the meat pierogi really created almost a very thick milkshake like sensation in my mouth, but without the distraction of artificial sweetness. All that I tasted was that this substantial meat, this symbol of my very personal triumphs, tasted as sweet creaminess – not watery creaminess – but thick and robustly satisfying creaminess. In other words: Triumph. I felt the same sensation in my mouth with the cheese pierogi, although the cheese filling seemed to be of such a high quality that mixed with the sour cream, it really put me over the top in terms of pure ecstasy. This was the sweetness of post-victory resolution, looking back on the struggle and observing humbly the resultant elevation of character that true struggle yields. Truly something that each individual needs to experience. Finishing with the robust (but not coarse) potato pancake (again with sour cream), I was brought back to the reality of my future struggles. Not that the potato pancake caused this to come to the forefront of my mind, but I was reminded by the grounding, earthy reference that a potato taste has. I was, after all, at the midpoint of my journey in life and, although triumphant thus far in spite of the odds each of us face, I was still ordinary, and therefore still had much struggle ahead. Still, the sweetness of that struggle remained in my mouth with the sour cream, sweetening a bit the groundedness of the potato pancake, encouraging my feet to take a centering base position, much like a Tai Chi grounding stance, to prepare myself for the next battle of life. Knowing that I can return to Neptune whenever I want to taste the Pierogis of Triumph, the sweet reminder of victories of many people and of one person, to be reminded that I am the right person for these battles and that I’ve won before and can maybe even win again, is a luxury in life – if not an absolute necessity. I love Neptune, I love the pierogis, and gratefully, I am reminded with each bite how precious each day of sweet life can be. With or without sour cream.